It was a mixed bag of results for the Vikings over the weekend, with the Premier Grades, ViQueens and 3rd Grade all playing in different locations. The Premier Grades took on formidable Queanbeyan packs in front of the their old boys, while the ViQueens took on ADFA at Dowsett Oval, 3rd Grade on the bus in Young. 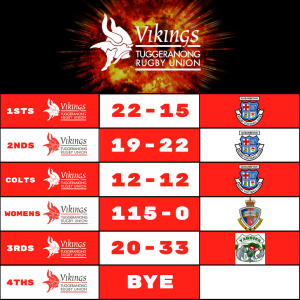 There were some positive results, though, as the Vikings enter the second half of the season, each match crucial to each Grade’s finals aspirations. For the second time in three weeks, 3rd Grade were on the bus travelling interstate for their match, this time out to Young to take on the Yabbies. The Thirsty Thirds featured a formidable forward pack, star prop Dan Solofa shifting to No. 8 and Nick Cushan debuting at blindside flanker to add some serious size. It wasn’t to be the Vikings day, though, the Yabbies’ backline outclassing the Vikings on their home pitch. It wasn’t all bad for the Vikings, however – Matt Wafer has finally overcome his foot injury to have a tireless day in the front row, the Englishmen providing punch in both attack and defence. The Vikings were still able to earn a 4 try bonus point and keep their finals hopes alive, and from all reports had a wild bus trip back dressed in bright colours. 3rd Grade fall to Young, 33-20. The ViQueens made their way out to the pristine Dowsett Oval to take on ADFA. During their last encounter the ViQueens made light work of their opponents, putting on 83 points to nil in a dominant display. This match would be no different, the ViQueens opening the flood gates from the kick off to rack up a cricket score. The likes of Violeta Tupulola and livewire Rhianna Burke started early by breaking the line and setting the platform for their team to score from. Carlie Hanna showed how much she had improved, with impressive leg drive with ball in hand as she carried defenders with her upfield. Carlie’s performance earned her Player’s Player for the match. But the star of the show was Tayla Stanford – Tayla made Club history on Saturday, crossing for 10 tries and smashing the Club’s record, previously held by team mate and friend Kate Brown, for most tries in a single match by a player. This was another fantastic effort by the ViQueens, who are improving week to week as they enter the second half of the season. ViQueens 115 – 0 ADFA. The Colties will take a lot of lessons from their match against Queanbeyan, at an important time with the finals in sight. Both teams squared off in a physical encounter. Queanbeyan had large majority of the possession in the 1st half, capitalizing on the Vikings errors and keeping ball in hand. The Vikings defence held solid, though, lead by Cooper Taekata who took space early and chopped low. The Vikings went into half time with a narrow 5-0 lead, determined to hold off Queanbeyan who had the wind in their sails thanks to the club’s celebration of Old Boys day. The second half was all Queanbeyan again, the Vikings Colts doing themselves no favours by giving away possession with loose carries. Seamus Smith’s injection into the game following an unfairly scheduled uni exam provided the Vikings with some spark and direction, the defence continuing to hold the Whites at bay. However, neither side could be separated at the final whistle, the game ending a 12-12 draw. The Colts remain undefeated, but will be looking to make a statement upon their return in Round 11. The match that could have been for 2nd Grade, who took on the undefeated Queanbeyan Whites in a characteristic tight encounter. The Vikings attacked well in patches of the game, threatening the Queanbeyan line and ensuring good field position. Lua Vailoaloa had a great game, marshalling the troops around the paddock superbly and leading the attack, leaving this writer questioning whether he’ll still have a 1st Grade jersey in two weeks time if Lua continues to play the way he has been. 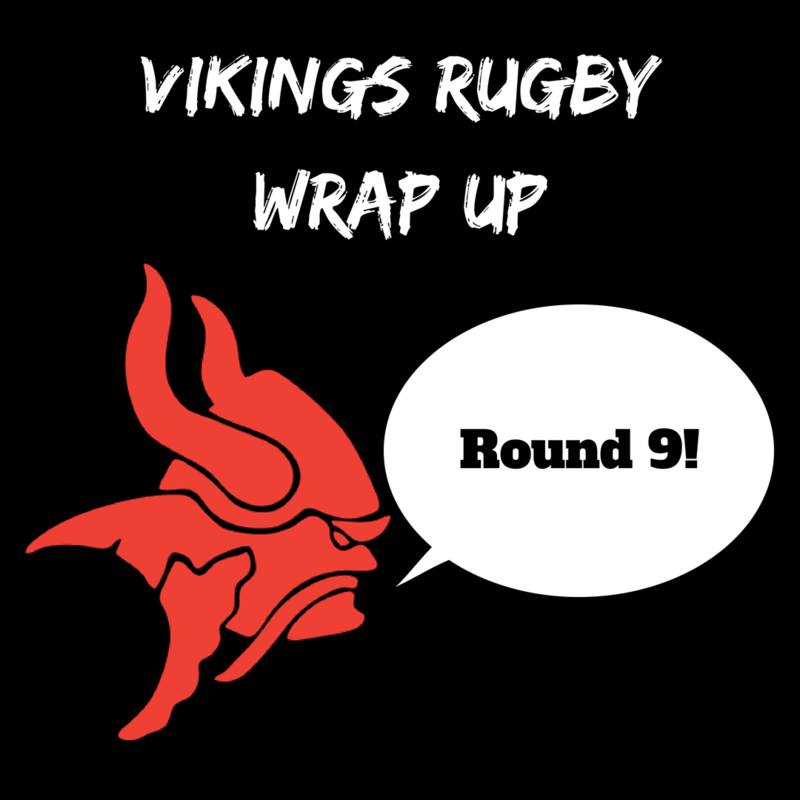 The Vikings were unable to convert on several occasions in their opposition’s 22 but were markedly improved in their defensive effort, keeping the game on a knife’s edge. The Vikings scored a try with little to no time left on the clock, Jayden Macken converting to bring the scores level at 19-19. However, it was the Vikings discipline that had hindered them for the entire game that would eventually lead to their downfall, giving away a penalty after the buzzer to allow Queanbeyan to slot a penalty goal and win 22-19. Determined to continue their form from their previous encounter at Campese Oval, 1st Grade started the match quickly and with flair, keeping the ball in hand and playing with plenty of intensity. Brendon Taueki crossed for the first try of the match, scoring off an Isaac Thompson inside ball following some quick ruck play. Brendon continues to pile on the points this season, touching down for a brace in a man of the match performance. The Vikings defence held solid, the Whites only scoring one try in the first half. Although the Vikings had the momentum, they were unable to convert their opportunities into points several times in the first half, keeping Queanbeyan in the fight. The second half the Vikings began exploiting the space in Queanbeyan’s back field, Brendon Taueki and Isaac Thompson cleverly placing kicks to pin Queanbeyan in their half. But this didn’t stop the Whites – inspired by their Old Boys, Queanbeyan mounted a come back in the final 10 minutes of the match, marching up field and scoring a try to put them within reach of a possible draw. The final whistle sounded but play continued, Queanbeyan peppering the Vikings defence. It wasn’t to be, however – Vikings showing their toughness to secure an uplifting 22-15 victory. Thanks to Queanbeyan, ADFA and Young for hosting us and for giving us another great weekend of Rugby. Next weekend is a Competition Bye, but you can join us on the 16th of June for our game against the Uni-North Owls when we host our OzHarvest Charity Day – be sure to attend and help us support this incredible organization! You can find more information on our Charity Day by clicking here.